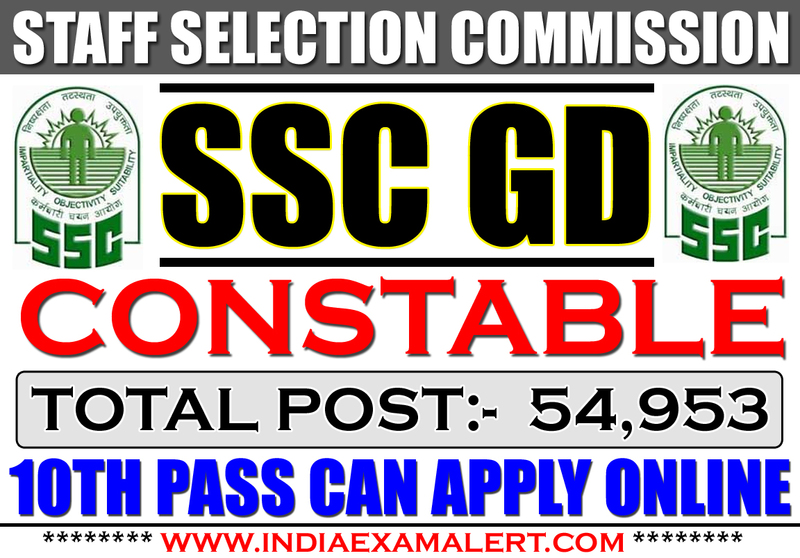 SSC GD Constable Recruitment 2018 – Apply Online for 54953 GD Constable Post:- Staff Selection Commission (SSC) published an employment notification for recruitment to the posts of SSC GD Constable (General Duty) in Border Security Force (BSF), Central Industrial Security Force (CISF), Central Reserve Police Force (CRPF), Indo Tibetan Border Police (ITBP), Sashastra Seema Bal (SSB), National Investigation Agency (NIA) and Secretariat Security Force (SSF) and Rifleman (General Duty) in Assam Rifles as per the Recruitment Scheme formulated by the MHA and the Staff Selection Commission. Educational Qualification:- Candidates should have completed their Matriculation (10th) class from any recognized Board or University. (1) Applicant’s who have not acquired the essential educational qualification as on 01.08.2018 will not be eligible and need not apply. (2) The candidates must bring all relevant documents / certificates in original with self attested copies pertaining to age, education, caste, domicile, hill area, any category for relaxation. No Objection Certificate (NOC) / discharge certificate (in case of ex-servicemen), which verified at the time of DME by CAPF Board. Age Limit:- Candidates age should be between 18-23 years as on 01/08/2018. Candidates should not have been born earlier than 02.06.1995 and later than 01/08/2000. Note I:- The upper age limit is relax-able for SC, ST, OBC, Ex-Servicemen and other categories of persons in accordance with the Governments orders on the subject. Note-II:- Candidates should note that only the Date of Birth (DOB) and Name as recorded in the Matriculation/ Secondary Examination Certificate or an equivalent certificate will be accepted by the Commission for determining the age and name. No subsequent request for its change will be considered or granted. Ex-Servicemen 3 years after deduction of the military service rendered from the actual age as on the date of reckoning. 1. Candidates have to pay of Rs. 100/- (Rupees One Hundred only). 2. Application Fee should be paid through SBI Net Banking / SBI Challan or by using Visa, Mastered / Maestro Credit or Debit Card. 3. Women candidates and candidates belonging to Scheduled Caste, Scheduled Tribe and Ex-Servicemen eligible for reservation are exempted from payment of fee. 4. Applications received without the prescribed fee shall not be considered and summarily rejected. No representation against such rejection will be entertained Fee once paid shall not be refunded under any circumstances nor will it be adjusted against any other examination or selection. Note-I:- Fee once paid will not be refunded under any circumstances. Note-II:- The facility for submission of online application including payment of fee will available from 21.07.2018 to 20.08.2018 (05:00 PM). However, candidates who wish to make the payment through challan of SBI, may make the payment at designated branches of SBI within the working hours of bank up to 23.08.2018 provided the challan has been generated by them before closing date and time for receipt of application i.e 20.08.2018 (05:00 PM.). Note-III:- Candidates who are not exempted from fee payment must ensure that their fee has been deposited with SSC. If the fee is not received by SSC, status of Application Form is shown ‘Incomplete’ and this information is print on the top of the Application Form. Further, such status can be verified at ‘Check your Application Status Here” tab provided at http://www.ssconline.nic.in. Such applications which remain incomplete due to non-receipt of fee will be SUMMARILY REJECTED and no request of consideration of such applications and fee payment after the period specified in the Notice of Examination shall be entertained. Candidates have to apply online through the Staff Selection Commission (SSC) official website http://www.ssconline.nic.in. or ‘Click here to apply’ link provided at http://www.ssc.nic.in>Apply>GD-Constable. Friends I going to discuss about SSC GD Constable Selection Process. So, the selection process will be consist via 4 step. Number (1) Computer Based Examination (CBE), (2) Physical Efficiency Test (PET), (3) Physical Standard Test (PST) and (4) Medical Examination. Those applicant’s whose applications are found to be in order will be called to appear in the Computer Based Examination. The Staff Selection Commission will conduct the examination for all candidates in Computer Based Mode only. Admit Card for the Computer Based Examination will be uploaded on the organization official website of the concerned SSC Regional Office. Computer Based Examination will be held in English & Hindi only. The Number of applicants shortlisted for PET / PST on the basis of merit in the Computer Based Examination. Only those candidates who qualify in PET/PST and are shortlisted for DME by the Commission. Detailed Medical Examination is mandatory but of qualifying nature. Collection of required eligibility certificates / documents from the candidates and their verification with original documents will be carried out at the time of Detailed Medical Examination by the CAPFs. Admit Card for PET / PST and DME / RME will be uploaded on the CRPF website http://www.crpf.gov.in. PET / PST and DME / RME will be conducted by various CAPFs as decided by CRPF. 1. BSF (A) 2. CISF (B) 3. CRPF (C) 4. SSB (D) 5. ITBP (E) 6. Assam Rifles (F) 7. NIA (G) 8. SSF (H). SC, ST, OBC and ExS candidates, who are selected on their own merit without relaxed standards, along with candidates belonging to other communities, will not be adjusted against the reserved share of vacancies. Such candidates will be accommodated against the unreserved vacancies as per their position in the overall Merit List. The reserved vacancies will be filled up separately from among-st the eligible SC, ST, OBC and ExS candidates. Note: The candidates applying for the examination should ensure that they fulfill all the eligibility conditions for admission to the examination. Their admission at all the stages of examination will be purely provisional, subject to their satisfying the prescribed eligibility conditions. If, on verification, at any time before or after the Computer Based Examination. PET / PST and Medical Examination as well as after issue of Offer of Appointment / Joining the Force / Organization, it is found that they do not fulfill any of the eligibility conditions, their candidature / selection for the post will be cancelled by the Commission / CAPFs. Note: I want to inform all the eligible candidates to read the official organization notification very carefully before the final submission of application form and if they want to know more about SSC GD Constable Recruitment 2018 – Apply Online for 54953 Post like educational qualification, age limit, examination fees, pay scale, selection procedure, organization official website, examination process, follow my article and definitely organization official notification.